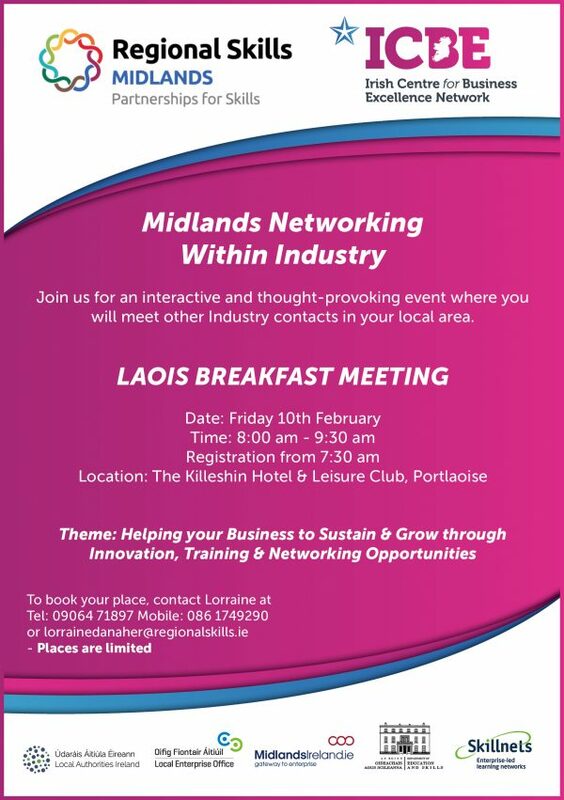 – Laois on the 10th February in The Killeshin Hotel & Leisure Club, Portlaoise. – Offaly on the 17th February in The Tullamore Court Hotel. This event will highlight the value of industry networking and the economic impact that training and innovation has on a company. The Midlands Regional Skills Forum was created as part of the Government’s National Skills Strategy and provides an opportunity for employers and the education and training system to work together to meet the emerging skills needs of the region. A more structured engagement on the skills agenda and the work of the Forum will contribute to better outcomes for learners and support enterprise development. To capture issues that industry may have regarding training and obtaining a skilled work force and the retention of staff. Join us for an interactive and thought-provoking event where you will meet and hear from other Industry contacts in your local area.